This bug requires no example file to reproduce. 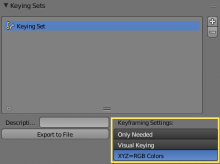 Open Blender, go to the Scene Properties, and add a Keying Set. Examine the "Keyframing Settings" for the keying set and notice what happens when you click them. Turning on one option disables the others, which might lead a user to think that these three miscellaneous options are related, but they are not. Enabling more than one option in this panel requires the user to hold down shift while clicking. This makes no sense and no other area in the properties window behaves like this! I think this design flaw counts as a bug. These options should not be grouped this way, and ought to be in the form of checkboxes instead. Sam Brubaker (rocketman) added projects: BF Blender, User Interface. Assigning to self. I've been annoyed about this for a while now. IIRC, at the very beginning, a very long time ago, it wasn't like this. Then, it suddenly changed once, when someone used the enum bitflag prop-widget and/or wrapped all of them in that way... which is incorrect of course. Then there's the side issue that even if these buttons look ok, they don't actually completely function in the intended way: that is, it was intended that you could use these to override the defaults, but that doesn't work atm. Joshua Leung (aligorith) closed this task as Resolved.